If you’ve been making considerations and provisions for your next big smartphone purchase; the Nokia Lumia 1020, Samsung Galaxy S4 or perhaps even the Glamour Red HTC One; you may wish to put those plans on hold just momentarily. 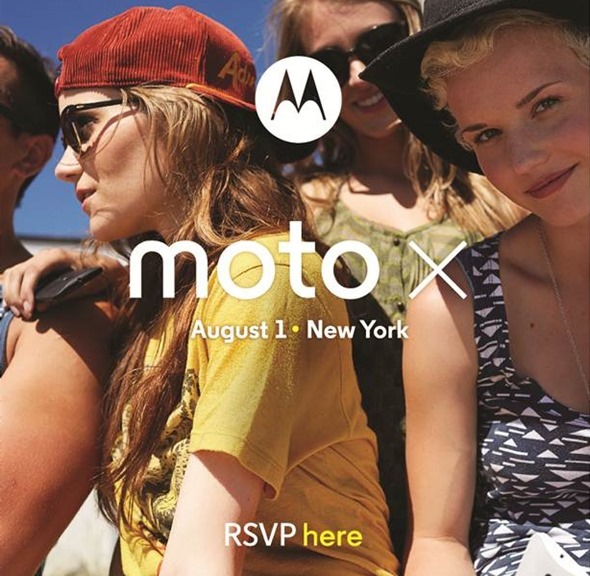 The hugely-anticipated Moto X smartphone looks set to be revealed on August 1st with Google’s purchase of Motorola Mobility finally bearing some fruit, and although we already have a relatively strong idea of what’s in store for this handset, the Big G’s invitation spree suggests we won’t have to wait very long to see it in all its glory. Motorola, despite still retaining a loyal fan base, has certainly lost its way somewhat during the past few years. Once a big player in the mobile game, it has certainly lost its cool factor and general appeal, with consumers preferring the Apple iPhone or Samsung’s vast wealth of smartphone offerings over anything Motorola has put out. Under Google’s guidance, the brand is certainly due a rejuvenating break, and such could well be provided in the form of the Moto X smartphone. It has been an on-off topic in the blogosphere for a number of months now, and with just over ten days until the big reveal, we cannot wait to see its grand unveiling. The invitation itself actually offers a glimpse of the device, and although we’ve seen it enough times already, thanks to several leaks when it was called the ‘Google X’ at that time, it will be interesting to note the reception of the general public upon its launch. It’s the first Motorola handset built under the watchful eyes in Mountain View, and with plenty of scope for customization on the part of the end user, it will be an Android experience fit for the masses. Just like the majority of Nexus devices, the Moto X is expected to be fairly easy on the wallet. Some have touted its price as little as $199 unsubsidized, which would render it a very enticing prospect indeed. Starting at such a low price is a typical Google move, and one from which it can eventually build upon to potentially offer higher end Moto X-branded devices in the future. It’s also interesting to note that this event is being held apart from the Android event that is being hosted by Google on 24th July. A reveal that deserves a separate event? It might actually be something big, either for Google or Motorola. There has also been talk of a Moto X tablet, although it is unclear if such a device will be shown off on August 1st. Whatever the case, we’ll be following proceedings very closely here at Redmond Pie, so stay tuned!